If you require medical services that aren't covered by your insurance or if your insurance provider doesn't cover the total cost, your medical service provider may introduce a medical credit card as a solution. Medical credit cards can be used to cover Lasik or other vision procedures, cosmetic surgery, dental work, veterinary services, or other expensive procedures that you can't cover out of pocket. Before you decide to use a medical credit card for your expenses, here's all you need to consider. Medical credit cards aren't major credit cards, like credit cards with a Visa or MasterCard logo. They're limited use credit cards, similar to retail credit cards. That means these cards can only be used to cover medical services and only when the service provider accepts that particular payment method. Some medical credit cards can only be used for certain types of services. Make sure the card you apply for can be used for the service you're receiving. You won't be able to use your credit card for other purchases. 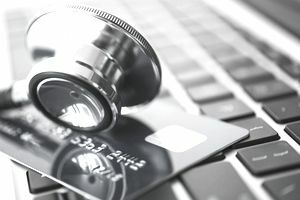 For some people, this limited use creates the temptation to pay for unnecessary medical services since they know the medical credit card will offer the convenience of paying over time. Because they're a credit product, medical credit cards require a credit check. You'll have to make an application, just like with any other credit card and you can be denied if you don't meet the credit qualifications. If you're approved, your account details will be reported to the credit bureaus, included on your credit report, and will weigh into your credit score. Paying on time is important to be sure your credit isn't affected. Some medical credit cards require you to repay the balance within a specific amount of time, rather than allowing you to make small minimum payments toward your balance. Repayment terms are typically short, ranging from 6 to 36 months. However, some medical credit cards offer repayment periods for as much as 60 months for more expensive procedures. Many medical credit cards ofer a 0% interest for an introductory period, but there's a catch with these offers. The promotion is actually a deferred-interest deal, which is much different from the 0% introductory offers you see with other major credit cards. With a deferred interest promotion, you have to pay the full balance before the promotional period ends to receive the 0% interest deal. Otherwise, if any of the balance remains after the promotional period, your account will be hit with retroactive interest starting from the initial transaction. Depending on the balance and the interest rate, your balance could wind up hundreds of dollars higher. Late payment penalties can be stiff – if you miss just one payment, you'll not only incur a late payment fee but you'll also lose your promotional interest rate; interest will kick in immediately. Deferred interest isn't that bad of a deal, as long as you understand that's what you're signing up for and you can afford to pay off the balance before the interest-free period ends. However, that's not always the case. Do the math before you agree to a deferred interest promotion. Divide the price of your services by the number of months in the promotional period and consult your budget to decide whether you can realistically afford to make these payments. If it's a stretch to make the payments, there's a good chance you won't be able to pay off the balance before the deferred period ends. Medical debt is such a problem in the United States that it's been cited as the number one cause of bankruptcy – and that's for medical debts that are billed directly to patients. Putting medical services on a credit card can make debt even worse. A common problem with medical credit cards is that they are promoted by medical staff who aren't always fully aware of the terms and conditions of the credit cards. Too often, patients are left without the cost information they need to make an informed decision. And since medical staff promote the credit card directly, patients may believe they're signing up for an in-house payment plan with the medical office rather than opening up a new credit card account. This fact may have led the patient to turn down the offer. Medical service providers are paid within a few days of the transaction, regardless of whether they've performed the services yet or not. Consumers often can't get a refund if they elect not to get the services. Consider medical credit cards just as carefully as you would any other credit card – perhaps even moreso since you're going to use it right away. Evaluate any special financing, the regular APR, fees, late payment penalties, etc. It's especially important that you read the fine print before you sign up for the credit card. Make sure you ask your service provider for all these details before you agree to the credit card. Weigh it against your other options before you make a final decision. If you have to put your medical procedure on plastic, you don't have to use the credit card presented by the medical office staff. You can use a credit card you already have as long as you have enough available credit. You might even apply for a credit card with a zero percent promotional APR on purchases. If you qualify, it will be a true zero percent interest deal - only the balance that remains after the promotional period will be charged interest at the regular rate. You may be able to use another medical credit card, one with better terms. You'll have to check with the credit card and your medical service provider to find out whether this option will work. You can also ask your provider for a payment plan – even if it means paying in installments upfront. You may be able to tap into your home equity or in cases of medical hardship, you may be able to make a penalty-free withdrawal from your 401k. There's nothing inherently wrong with using a medical credit card to help cover your medical expenses. Just make sure you understand and agree to what you're signing up for. Pay off the balance as quickly as possible to reduce the interest you pay and to ensure you pay within the deferred-interest timeframe, if there is one.